Breaking the Rules, Stretching the Rules 2011 is a monitoring report exposing how the leading 22 baby milk and feeding bottle companies market their products with strategies that violate the International Code of Marketing of Breastmilk Substitutes and subsequent, relevant Resolutions of the World Health Assembly. Evidence was gathered by members of the International Baby Food Action Network (IBFAN) around the world. A summary of the report was presented to journalist at the Geneva Press Club on 12 May prior to the 2011 World Health Assembly, resulting in international media coverage. For the media announcement, click here. In the film below of the English part of the press conference, Annelies Allain, Director of the International Code Documentation Centre, which prepared the report, explains the latest marketing trends. Mike Brady, Campaigns and Networking Coordinator at Baby Milk Action, explains why companies are still able to get away with violating the marketing requirements in some countries and what is being done and needs to be done to stop them. Supporting documentation is given below the film. Some of the resulting media coverage (Reuters article): India, Malaysia, New Zealand, Singapore, Turkey, USA, AlertNet. Print media: South China Morning Post. (If you see media reports in your country let us know in the comments, and post a link if possible). 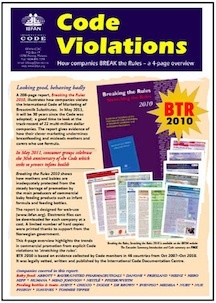 Click here to download the four-page summary of Breaking the Rules, Stretching the Rules 2011. Click here to order full company profiles. The information provided by Mike Brady is given below with links to supporting documents. Thank you for the invitation to speak here today. I think it is important to make the point that we are not talking about allegations of what the companies are doing. The report and the summary that you have shows the companies' own materials, their product labels. We are not just saying they are breaking the rules, you can see what they are actually doing. When we see that companies are violating the marketing requirements so blatantly and so systematically, the inevitable questions are : how can they get away with this and how can we stop them ? The truth is in many countries they cannot get away with it. Around 70 countries have implemented many of the provisions of the International Code and Resolutions in legislation [Note 1]. In countries such as Brazil, which has particularly strong and well enforced legislation, you don’t find the violations that are commonplace elsewhere. Partly because of this, median breastfeeding duration has increased from 3 months in the early 1980s to over 10 months today [Note 2]. And that is the issue. Companies are competing with breastfeeding and if breastfeeding rates improve they lose sales. So we see them targeting mothers and pregnant women, and increasingly trying to link with education systems as well as trying to co-opt health workers. They may say that they support breastfeeding and put required ‘breastfeeding is best for babies’ warnings on labels, but they carry on with the strategies we have been hearing about and they intend to continue. We also want to protect babies who are fed on formula. Companies are reluctant to be honest about risks of formula feeding, for example failing to warn on labels that powdered formula is not a sterile product or provide information on the simple steps to reduce risks, unless they are forced to do so, as they are in the UK [Note 3]. Nestle, which controls 29% of the global baby food market according to industry analysts Euromonitor, responded to the report last week saying it would only take remedial action over 4 out of the 130 violations it counted, dismissing the rest [note 4]. That’s just 3%. In our view, Nestle is the worst of the companies which is why it is targeted with boycott action to give executives a financial reason for making changes. According to an independent survey, Nestlé is one of the four most boycotted companies on the planet. Nestle’s refusal to change will fuel the boycott and we will raise this at the boycott demonstration we will be holding outside its UK headquarters on 21 May [note 5]. Danone, which jumped to second place in the market with the acquisition of NUMICO brands, Nutricia, Milupa and Cow & Gate, in 2007 promised us a ‘root-and-branch’ review of marketing practices soon afterwards. We are disappointed to see so many Danone violations in the 2010 report. You may ask, why is there no Danone boycott? And we are questioning whether that will be necessary to focus the minds of executives. However, in response to the report Danone has told us that action it has already taken will stop 50% of the violations in the report. That is its own assessment and we need details, but it is welcome that Danone accepts 50% of the violations need to be stopped and is a clear contrast to Nestle’s 3%. But why not 100%? Danone has told us that it will also remove the ‘Immunofortis’ claim that you will see in many of the examples of violations in its profile [Note 6]. I think this shows the great value of these monitoring exercises in exposing violations and prompting change and applaud ICDC for its hard work in coordinating the project and bringing the report together. That said, it is not our job to do companies’ work for them. Both Danone, Nestle and the other companies should ensure their practices at every level comply with the Code under Article 11.3. We shouldn’t need to constantly cite examples of violations. They all could and should do better. Nestle really couldn’t do much worse. While Danone is removing its immunofortis claim, Nestle is defending the logos claiming its formula ‘protects’ babies, as shown on page 24 of its profile. These are a clear violation and should be removed. [Note 7]. This brings me to my final point. What should the UN and international community be doing? Nestle is a leading member of the UN Global Compact and was a patron sponsor of the Compact's 10th anniversary celebrations in New York last year. All this while we have been pursuing a complaint against Nestle under the Global Compact Integrity Measures. Although these give the Global Compact Office the power to review companies and exclude them, the Office says that it prefers to ‘promote dialogue’. We ask it to look at and review the replies we receive from Nestle. The Compact Office says it prefers to keep companies in the voluntary initiative to ‘learn from their mistakes’. Well, Nestle makes plenty of mistakes, but just seems to have learned to use the Global Compact as public relations cover to divert criticism. We have also tried to use the OECD Guidelines for Multinational Enterprises, another voluntary initiative, with similar lack of progress. [Note 8]. So to conclude, these companies get away with as much as they can as they can because they put their own profits before infant health and mothers rights. Legislation is needed to stop them. Where that does not exist or is ineffective, we need international measures and we call on the international community to revise or replace the UN Global Compact system. This voluntary initiative is not only ineffective on this issue, it is more of a problem than a solution. Which leaves us with civil society exposing malpractice as in this report and bringing pressure through the Nestle boycott and other campaigns. The media has an important role to play in this, of course, by looking at what companies are actually doing on the ground, not just what they say, exposing this and questioning executives and policy makers on what action they will take. See State of the Code by Country 2011. See A review of breastfeeding in Brazil and how the country has reached ten months' breastfeeding duration. The graph that shows increasing breastfeeding duration and significant actions includes NBCAL (Norma Brasileira de Comercialização de Alimentos para Lactentes) and its various revisions, which is the Brazilian implementation of the International Code of Marketing of Breastmilk Substitutes and subsequent, relevant Resolutions of the World Health Assembly. It also refers to IBFAN Treinamento (IBFAN Training on the Code). The NBCAL restricts all promotion of infant milks and baby foods up to three years of age. Also see the Brazilian case study in the 2004 IBFAN report, Checks and Balances in the Global Economy. The World Health Organisation introduced Guidelines for the safe preparation, storage and handling of powdered infant formula following deaths linked to intrinsic contamination of products with Enterobacter Sakazakii, in particular the death of a 5-day-old child in Belgium in 2002. IBFAN has called on companies to revise labels and other information accordingly. See, for example, Baby Milk Action's 2007 survey of company 'carelines'. 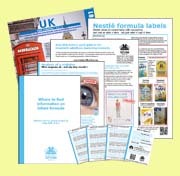 The Food Standards Agency introduced Guidance Notes accompanying the UK Infant Formula and Follow-on Formula set out labelling requirements (see section 24 of the Guidance Notes). New labels began to appear on the UK market in 2009 (see Update 42). Baby Milk Action has produced a DVD called Infant Formula Explained on behalf of the UK Baby Feeding Law Group showing how to prepare formula in line with WHO Guidance. Nestlé's 77-page response to the Breaking the Rules report is available here. An initial response from ICDC can be found here. Nestlé says it has discontinued a leaflet from Egypt claiming its formula is 'The new "Gold Standard" in infant nutrition' as one of the four violations. This was targeted in Baby Milk Action's Email Nestlé campaign which saw thousands email Nestlé. A scan of the leaflet in question can be found on the campaign page. Nestlé refuses to remove the 'protect' logos also featured in that campaign, but one of the four cases relates to DHA claims made in an advertisement in South Africa. It recently acknowledged in response to the Email campaign that claimed benefits of adding DHA to formula are 'not proven', but its response to BTR is about tweaking wording, not stopping making claims about DHA benefits. For more on Nestlé and DHA see Update 43. Another of the four cases relates to targeting health care professionals in Papua New Guinea in breach of government policy. Although caught out on this occasion, Nestlé continues to target health workers with sponsorship, invitations, gifts etc. (for example Nestlé's targeting of health workers in India in breach of its Infant Milk Substitutes Act - click here). It appears that the fourth case relates to a shelf-talker. Yet Nestlé has defended shelf-talkers elsewhere, such as in South Africa where its competitors took it to the Advertising Standards Authority alleging a violation of the Code. Although Nestlé claims to abide by the Code in developing countries, in reality it points to weaker voluntary measures to defend violations, using in the case of South Africa a ruling in its favour by the ASA - which it finances as an advertiser - to dismiss criticism (details here). Hence Nestlé 'remedial action' does not constitute an acceptance that the practices should stop - and, of course, it disputes the validity of the remaining 97% of the violations. A 2005 survey by GMI found Nestlé to be one of the four most boycotted companies on the planet and the most boycotted in the UK (report in The Guardian). Baby Milk Action organises an annual demonstration at the Nestlé (UK) HQ in Croydon. The 2011 event was achieving international coverage even before it took place - report in the Philippines. For Baby Milk Action's ongoing campaign calling for Nestlé to remove the 'protect' logos, and Nestlé's responses, see Email Nestlé. For information on Baby Milk Action's complaints under the UN Global Compact and OECD Guidelines for Multinational Enterprises and Nestlé's sponsorship of the Global Compact 10th anniversary celebrations, click here. For detailed proposals for a possible international regulatory framework, see Mike Brady's chapter on corporate accountability in the book Global Obligations for the Right to Food.